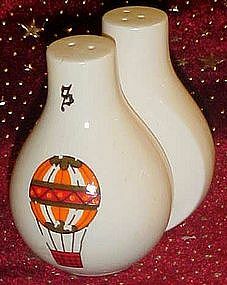 Nice ceramic shakers fit flat back to back as shown in photo. Each has a colorful hot air balloon and the letter S or P. Measures almost 4" tall and are in great condition with no damages. Paper Japan label, and both have plastic stoppers.